Augustine Heights is a new suburb of Ipswich, and gained its name from St Augustine’s Catholic Church and College. The name Augustine is from the Roman name Augustinus, derived from Augustus, meaning “great, venerable”. Its most famous namesake is the theologian Saint Augustine of Hippo, considered one of the most important Church Fathers. He describes his conversion to Christianity in his Confessions, which has become a classic of Christian literature. The name became popular in England in the Middle Ages because of Saint Augustine of Canterbury, a 6th century founder of the English church known as the Apostle to the English. It is probably because of him that there is an English form of Augustine – the popular Austin. In France, Augustine is a girls name, the feminine form of Augustinus. Bowen Hills is an inner-city suburb of Brisbane. It is named after Sir George Bowen, an Irishman who was the first Governor of Queensland. Tactful and democratic, with a great love of the outdoors, he made himself popular enough to be invited to serve two more years when his term had expired. There are a few places in Queensland named after Sir Bowen, including Bowen Park, a pleasure garden in Bowen Hills. The surname Bowen can be Welsh, meaning “son of Owen“, or it can be Irish, in which case it is an Anglicised form of the Gaelic O’Buadhachain, meaning “son of Buadhach”. The name Buadhach means “victory, triumph”. This name reminds me of the Bowen Technique, an alternative massage treatment developed by Australian Tom Bowen, although Bowen is a knight and dragon-slayer in the movie Dragonheart. Rarely seen here, Bowen is in the Top 1000 and rising for boys in the US. It gives the unisex nickname Bo, and for some reason I see this as a girls name just as much as a boys. Chandler is a semi-rural outer suburb of Brisbane. It is named after Sir John Beals Chandler, a successful businessman with a chain of electrical goods stores, and who owned several radio stations. He was elected to the Queensland Parliament in the 1940s, and Lord Mayor of Brisbane in the 1940s and early ’50s. Chandler is an English occupational surname, which denoted someone who made and sold candles, or someone who was responsible for the wax, soap, candles and lighting in a medieval great house. This name will remind many of Chandler Bing, from popular sit-com, Friends. Mount Crosby is an outer suburb of Brisbane adjoining the state forest. It is named after its dominant natural feature, Mount Crosby. The first settlers to this area were from the village of Crosby-on-Eden, near the Scottish border, and it seems likely that they named their new home after their original one. The surname Crosby is after the place name, a common one in northern England and southern Scotland. The name is of Old Norse origin, and means “settlement by the cross”; as we learned from Cruz, these stone crosses were often used as markers. Famous Crosbys include entertainer Bing Crosby and musician David Crosby. The name has recently begun charting in the US, after drama series Parenthood was shown on television there. The show has a character called Crosby Braverman, played by Dax Shephard, and the name must have resonated, because it went up 69 places last year. Crosby is rare in Australia (I’ve only seen it on a child once), but maybe Parenthood will have an effect here too. Ebenezer is a suburb of Ipswich. It had been a preaching place on the Methodist Church circuit since 1863, and by 1882 a church had been built named the Wesleyan Ebenezer Church. It is from this church that the suburb gets its name. In the Old Testament, Eben-Ezer is a place mentioned as the scene of battles between the Israelites and the Philistines; its modern day location is not known, but it is probably in Palestine or Arabic Israel. Eben-Ezer is from the Hebrew for “stone of help”, and it is theorised that a stone dedicated to Yahweh may have been located here to give it its name. Its most famous namesake must be Ebenezer Scrooge from Charles Dicken’s A Christmas Carol, the cold-hearted miser redeemed by three spirits of Christmas. I think the name Ebenezer sounds pretty hip now, and an Old Testament boys name which has been overlooked for too long. Eben and Ben would make good nicknames. Hamilton is a hilly inner-city suburb of Brisbane on the Brisbane River which was built by convict labour. It soon became known for its upper-class country houses and estates, ornamental shade trees, picturesque location and fine views of the city. 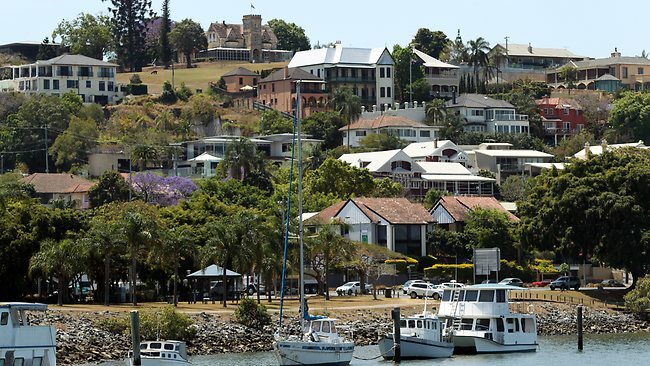 Hamilton is associated with “old money”, and has the highest mean income of any suburb in Queensland. It is named after the Hamilton Hotel, built in 1865 by Gustav Hamilton, a wealthy solicitor who owned most of the land in the area. It soon became known as a meeting place for the horse racing world, as the Turf Club is nearby, and is still popular today. Hamilton is an English and Scottish surname after the village of Hamilton in Leicestershire; its name means “crooked hill” in Old English. The aristocratic Hamilton family gained lands in Lanarkshire, Scotland, and gave their name to the town of Hamilton there. The Hamiltons married into the Scottish royal family, and the Duke of Hamilton and Brandon is the highest peer in Scotland. A famous person with the name is Hamilton Hume, an early Australian explorer of New South Wales who was a top-notch bushman and formed friendly relationship with Aboriginal peoples. This is a name with an impressive pedigree. The city of Logan is halfway between Brisbane and the Gold Coast. It began as a penal settlement, and farming soon followed; it was developed for housing in the 1960s due to its laissez-faire planning laws. Logan is named after Captain Patrick Logan, the Scottish commandant of the original penal settlement, who had a reputation for being strict to the point of cruelty. He was a great explorer and was killed on one of his expeditions, most likely by Aborigines who had repeatedly told him to get off their land. News of his death was met with wild joy from the convicts. Logan is a Scottish surname; the Clan Logan comes from the “lands of Logan” in Ayrshire, which may be from the Gaelic for “hollow”, or even of Norman origin. In Ireland, it is considered to come from the Gaelic O’Leoghain, meaning “grandson of the warrior”. This name has many namesakes from popular culture, including the dystopian sci-fi film Logan’s Run, where Logan is played by Michael Yorke, and Logan aka Wolverine from the X-Men films, played by Hugh Jackman. Logan has charted since the 1970s (when Logan’s Run first screened), and ranked in the 1980s at #344. It climbed steeply through the 1990s and made the Top 100 by the 2000s. It is currently #38 nationally, #36 in New South Wales, #33 in Victoria, #65 in Queensland, #46 in South Australia, #28 in Western Australia, #17 in Tasmania, and #50 in the Australian Capital Territory. Sherwood is a suburb on Oxley Creek. Its name comes from a farm which was named after Sherwood Forest in Nottinghamshire, England. A Royal Forest, and remnant of an older and much larger royal hunting forest, it is one of England’s most ancient, having survived since the end of the last Ice Age. It is famous for its association with legendary folk hero Robin Hood, who is supposed to have lived in Sherwood, according to some sources. Sherwood in Brisbane even made its own Sherwood Forest Park, which is now, less romantically, the Sherwood Arboretum. The name Sherwood means “shire wood”. A famous person with the name is American author Sherwood Anderson. Tennyson is a riverside suburb named in honour of Alfred, Lord Tennyson. Tennyson was Poet Laureate of Great Britain and Ireland during Queen Victoria’s reign, and has the record for length of tenure as a Laureate at 42 years. Revered in his own time, he remains one of the popular English poets. One of his much-loved works is the Idylls of the King, a cycle of blank verse poems inspired by the legends of King Arthur; many of the streets in Tennyson have Arthurian names in compliment of the Idylls. For those amused by these coincidences, the Queensland Tennis Centre is located in Tennyson, and was once the Tennyson Tennis Centre. The English surname Tennyson means “son of Tenney”, with Tenney a pet form of the name Denis. Actor Russell Crowe has a son named Tennyson, after his favourite poet. This is a handsome and unusual name, with a great namesake, and would make an excellent middle name too. Windsor is an inner-city suburb of Brisbane, with many old homes, and containing several heritage-listed sites. It was named Windsor in 1887, most likely after Windsor Castle in Berkshire, England, as it was Queen Victoria’s Golden Jubilee Year. Windsor Castle was built by William the Conqueror, and was originally a fortification to protect the outskirts of London, with strategic views of the River Thames and access to the royal hunting forest of Windsor. Since the rule of Henry I, William’s son, it has been a royal residence, and is the largest inhabited castle and longest-occupied palace in Europe. Today it is a royal palace and weekend retreat for Elizabeth II, and state banquets and official entertainments are often held there – it is also a major tourist attraction. The castle is named after the nearby village of Windsor, once the site of a palace for the Saxon kings. Its name means “winding shores, winch shores” in Old English, because boats were pulled by windlass up the river. Famously, Windsor is the surname of the British royal family: the name was changed from Saxe-Coburg and Gotha by George V in 1917, due to anti-German sentiment during World War I. The final straw was when Germany used the Gotha G. IV aircraft to bomb London – just four months later, the Saxe-Coburg-Gothas had become the Windsors, the name taken from the royal palace. A famous person named Windsor is British actor Windsor Davies, best known as the sergeant on It Ain’t Half Hot Mum. Royal names are all the rage, and you can’t get any more royal than Windsor. POLL RESULT: People’s favourite names were Tennyson, Augustine, and Windsor, and their least favourite were Sherwood, Hamilton, and Ebenezer. I love Tennyson most 🙂 My uncle’s middle name is Hamilton. I like it in the middle too, but not as a first. I’ve only ever seen Hamilton in the middle actually – maybe the Ham thing does scare people off.